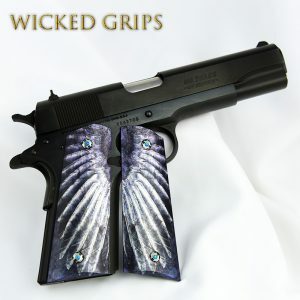 CUSTOM 1911 GRIPS BOBTAIL SET 293 PURPLEHEART ZEBRA AMBI SAFETY. 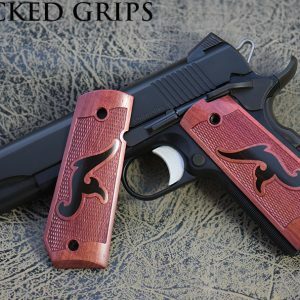 1911 FULLSIZE 1911 OR COMMANDER BOBTAIL FRAMES… VIEWED ON DAN WESSON GUARDIAN BOBTAIL, FITS ED BROWN AND KIMBER SUPER CARRY STYLE BOBTAILS… AMBI SAFETY FIT. 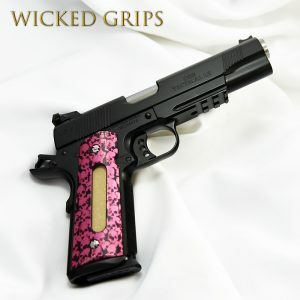 CUSTOM 1911 GRIPS MADE FROM PURPLEHEART WITH INLAYS OF ZEBREAWOOD, CUT CHECKERED TO 20 LPI. 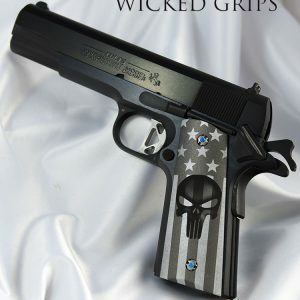 TRADITIONAL MINDED, BUT WITH WICKED GRIPS EDGE & ATTITUDE! ALL NEW! 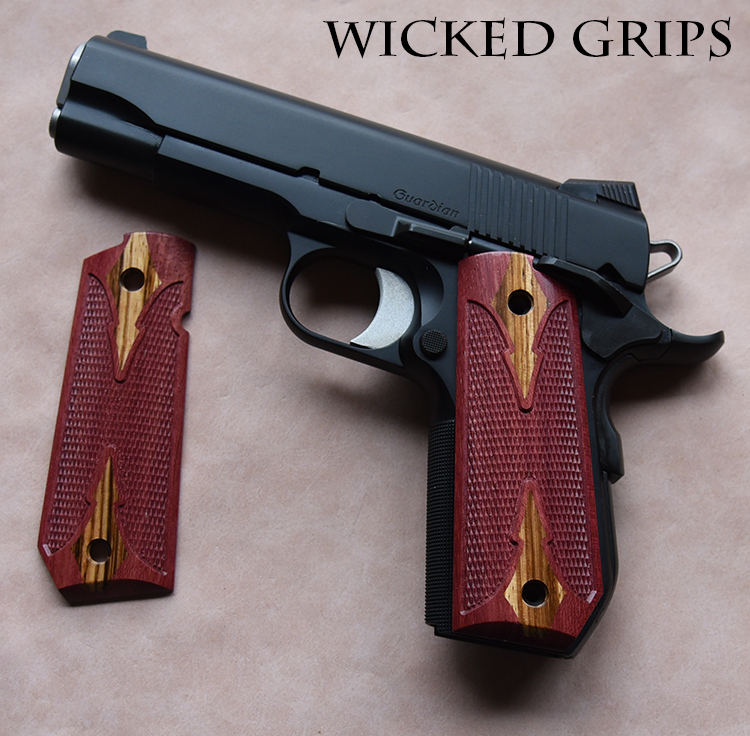 WE ARE VERY PROUD TO BRING YOU OUR NEWEST WICKED GRIPS WOOD SERIES! MADE IN PARTNERSHIP WITH OUR FRIENDS AT WOODCALIBER, OUR NEW SERIES IS BASED ON THE EXACT STYLE OF FIT WE ARE KNOWN FOR IN OUR HANDMADE GRIP SERIES, BUT WITH A TWIST! CNC MACHINED, THEN HAND FINISHED RIGHT HERE IN THE USA… EACH SET IS INLAYED IN A CONTRASTING WOOD. THIS IS TRUE INLAY! EACH SET IS TRULY A ONE OF A KIND.. A ONE OFF. WOOD AT THIS GRADE LEVEL WILL SHOW IT OWN UNIQUE GRAIN & COLOR, SO NO TWO SETS CAN TRULY BE THE SAME. YOU ARE VIEWING THE EXACT SET YOU WILL RECEIVE. EACH SET WILL COME BOXED IN OUR EXCLUSIVE COLLECTORS TIN PACKAGING!